Behold a pale horse, the final script (1). There's a reason for the pale horse to enter the stage on a football stadium, other than being at the very last Superbowl. "it seems whoever hands out the nobel prize doesn't know last year was the last one": Snowden was just nominated for the 2014 Nobel Peace Prize. The same Great Decider who hands out the Nobel prize built new stadiums and malls for the past years from the USA to the EU. - there were no longer consumers for those malls. - the VERY LAST Superbowl would take place for the first time in the 33th day of the year, the latest on Feb 2 2014, with the pale horse from Denver defeating the Seattle Seahawks. 19-14 was predicted at the Simpsons 2005 episode aired on 9/11: it adds to 33 and reads 1914, the year end times began. World War I was foremost a celebration of Illuminati religion's commandment "Slaughter the human cattle" of an unprecedented scale. Perfect symbology for the begin of the BIG BANG, where "modern" stadiums, designed primarly as exterminaton camps, play a central role. Denver Broncos alias the "New World Order" will be awarded a 31-13 victory to symbolically launch the BIG BANG, explained long ago by Last Prophet. But the reason for the score change has nothing to do with the reason why he HAD to change the Nobel Peace Prize 2013 winner. Unlike Syria there are no longer freedom loving people in the USA to prevent the fulfillment of the script. The devil's number (Hillary 13) reversing "Obama" (31) seems better, as "surprise". DHS/NSA activity preceding the Superbowl: the setup is in place for a false flag. Then DHS and all other paramilitary will come in and say that they just stopped an Al Qaeda threat of some sort, and therefore justify the further militarization of the police and totalitarian entrenchment. Or a 50/50 combo: the false flag will start to go live with minor chemicals, bombs, and whatnot, but the paramilitary will show up saying that they stopped a nuke. That way, the media has a chance to fear-monger a little, but also has the chance to say that tight security stopped a greater threat, and that therefore more security is needed on highways, bus stations, etc. The Day of the Lord is darkness not light. ... to accept the Mark of the Beast, the most horrible decision there is, because it can't be REVERSED. (3) The Simpsons TV series predicted 2014 super bowl on SEP 11 2005. Simpsons predicted 2014 super bowl on SEP 11 2005. 2. - Hitlery Clinton empowered 9 years after her younger sister Angela Hitler, known as "Merkel", first woman ever chanceller of Germany. Example of another script solely meant as parallelism to Hillary/Angela: first time ever two brothers as Superbowl coaches. "Obama" will be arrested on "live TV", with senate and congressmen as background, mimicking the North Korea theater, great leader's uncle arrested on live TV and eaten alive by dogs. As for the scripted 31-13 score for the very last Superbowl in USA History, it connects both scripts: Obama (31) reversed by one of the two sisters, more precisely Hillary (13). Hillary Clinton president after Obama impeached and stripped = reversed script, 15 years later, of "Bill Clinton acquited after his impeachment". Human cattle Stripped, genocide of of non-productive of 30 million this millenium alone in the OECD, from the EU to the USA, is now upscaled to non-whites. Disarm citizens: terminated by confiscating guns door to door. Immediately after comes the BIG BANG, Feb 2014. - launch of supervised race war: blacks, hispanics, asians and arabs against whites. Shortly after, Obama" fully detonates, jailed and stripped. Full scale race war, extended to all areas of the IV Reich with ethnic minorities. Last edited by TruthIsNeverTooHorrible; 02-01-2014 at 07:32 PM. Talk of the Simpsons and the very last Superbowl, the act of the REAL Truman show where the pale horse steps on stage, during the last episode. The illuminati supreme leader, the Great Decider of what happens at the Superbowl, played countless roles. Yet only ONE time did someone play his role: actor Ed Harris in 1998, as the Voice, Christ(of), the creator of the Truman show. That was 3 years after the only time that the Great Decider played himself, "coincidentally" only as voice (2). (1) Simpsons Episode Aired On September 11th 2005 Shows "Denver Beats Seattle"
"and I'm joined in the broadcast booth with the stars of ABC's newest reality show Billionaire vs. Bear. .. each of you thought you were in a race to place the taco bell flag at the top of the North Pole, but what you didn't know is the race was a chase all spiced up by the presence of the betrayer and the bear isn't a bear, he's a tiger. Oh lookie there Denver just won the ballgame."" a billionaire (Bull market/conservative) vs. a bear (soft market/liberal) thinking they're in a race. But the soft market liberal is really a Tiger working against himself…. possessed. Reality is, they are both being deceived by The Betrayer. Both sides of the competition are complete idiots as they get laughed at in their face. Sound familiar? Last edited by TruthIsNeverTooHorrible; 02-01-2014 at 07:41 PM. "I think the Broncos will win- if only because Colorado was the first state to legalize marijuana and all those good vibes will be flowing towards them.". As usual human cattle robotically repeats that BLACK is WHITE. Colorado was the first to legalize marijuana BECAUSE it's scripted for at least a decade that the Denver Broncos will beat the Seattle Seahawks at the very last Superbowl. Reductionism: no longer need to mention that Washington state came second. Super Bowl being set up for "attack by syrian rebels to be averted". And that's the only scenario where the probability of a Broncos victory on Feb 2 is NOT 100%. End Time Paradox: The chances of defeating the Pale Horse of Death at the Superbowl 2014 are ZERO, unless a fake attack is 'averted' after the game is over. In any case the chances of REAL dead at the stadium of the very last Superbowl, the very first to take place on the 33th day, are ZERO. 1. "Obama" must now FULLY detonate, to launch the BIG BANG: pension funds and savings annihilated, currencyt reset, extermination of millions in "modern" stadiums, malls and large schools during the supervised race war. 2, "Bashar Al-Assad" and his mercenaries, iranian, Hezbollah, Blackwater mercenaries, NATO and russian air pilots and last but not the least the fake rebels of Al-Qaeda alias Al-Nusra & ISIS, are about to collapse. Latest blow: Free Syrian Army annihilated the fake rebels in Aleppo and northern Syria. This despite the non-stop airbombing of civilians with chemicals and barrel bombs. ZERO chance of: Seahawks victory, unless "averted attack"
The PALE HORSE must now be unleashed, told by the Great Decider already in the Simpsons episode aired on 9/11 2005. The chances that the false flag will be BEFORE NOT AFTER the end of the game stand at 20%. The OWL's wisdom "averts the chemical attack by syrian rebels that would cause the death of tens of thousands" (1). ZERO chance of Real Dead in an staged attack by the illuminati. All "terror attacks" in the US since Virginia Tech 2007 and in the EU since Germany school massacre 2009 are TOTALLY staged with actors, ZERO dead. There will be no real terror attacks until Obama FULLY detonates, the latest next month. ZERO chance of another type of attack. There were no terrorist attacks in the US or the EU other than by the illuminati in the last two decades. To get this all you need is to get why illuminati supreme leader was forced to change the script forthe´very last winner of Nobel Peace Prize, 2013. "If you proper mix both team players emblems you actually end with a Stadium with a nuclear blast in the center!" There will be NO nuclear blast, although the illuminati suggest it ad nauseum. The two SeaHAWK heads give the head of one OWL. Jonestown, Guyana, 1978: No problem simulating nearly a thousand dead as long as it's staged in the middle of the equatorial jungle. - at the literal end of the marathon, with the arrival area restricted to the cast, starting with fake runners playing last runners arriving. But that's dozens of fake dead at a crowded stadium is impossible to stage. The few lines that say it all. Exposed by Last Prophet a few days after Sandy Hook, yet echoed by NOBODY ever since. 19-14 is perfect symbology for the begin of the BIG BANG, where "modern" stadiums, designed primarly as exterminaton camps, play a central role. Changed score has nothing to do with the reason why the Great Decider HAD to change the Nobel Peace Prize 2013 winner. The devil's number (Hillary 13) reversing "Obama" (31) is a "surprise" alternative for the score. - Europe's soccer Champions League: probably 2013. - Superbowl of 2013 NFL season: 2014. Illumianti Supreme Leader announced Denver Broncos vs Seattle Seahawks. Message was not hidden in plain sight but openly stated by the Simpsons episode aired on 9/11 2005. The Broncos, the pale horse of death, the obvious last champion, the Seahawks beaten by 19-14. Score adds to 33 and reads the same as the first year of End Times. - the opening and closing ceremonies of the very last Olympics, at London 2012. Setting the stage or the Superbowl included Colorado and Washington as the first and second states to legalize marijuana. It all changed on January 31, 2014: Illuminati Supreme Leader announced, this time not openly but hidden in plain sight, that the very last Superbowl would be NOT simulated reality but rather its parody. A parody of what the human cattle perceives as reality but in fact is completely simulated. To take two other "VERY LAST" type of major events: the same type of parody as the the drawings for the the supposedly next Football (Soccer) World Cup or for the very last Europe's Champions League, ongoing but with little chances of having the final still played. A "rehearsal" was introduced the previous day to "coincidentally" exactly "predict" the "real" drawings. No pale horse steps on stage, no terror attack is averted. - AVERTED: instead of "chemical attack by syrian rebels that would cause the death of tens of thousands averted". 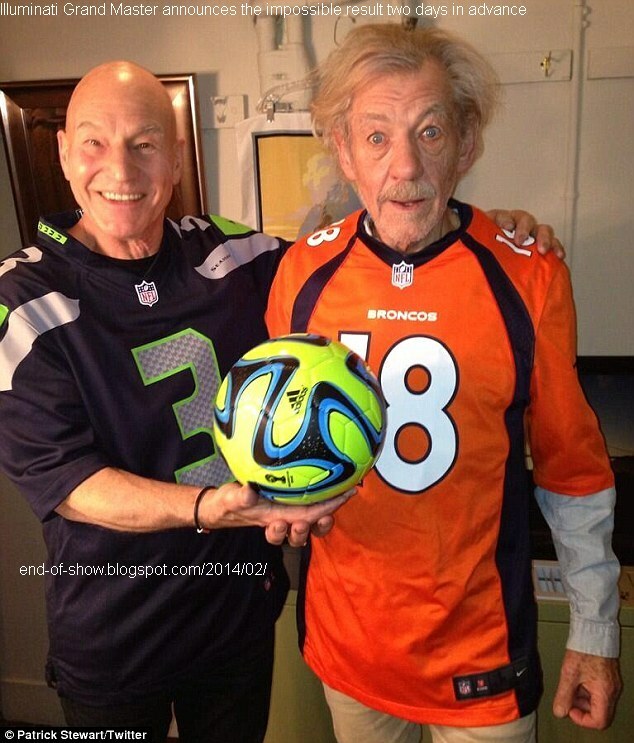 - DEFINETELY: Favorite Broncos not only defeated but also by the largest difference ever in a Superbowl. The last 12 minutes are both part of the parody part and of the original script. "Behold a pale horse", now it's the end of the end time; this is NOT just another FINAL, it's the LAST one. "With 12 minutes left in the game, Seattle scored to go up 43-8. We can begin to appreciate its unique status by noting that in 14,936 pro football games dating back to the 1920s, no game had ever finished 43-8. A team has scored 8 points in a game only 40 times. And a team has scored 43 points in one game 47 times. In the last 12 minutes, there were a few times this veritable four-leaf clover looked in danger of being trampled on. Twice, Seattle drove deep into Denver territory and decided to go for it on fourth down. Twice, the Broncos rose to the occasion to stop them. Moreover, Manning came through in the crunch. He could have really screwed up my score by leading his team to a touchdown. Had he done so, and failed at the two-point, we would have been faced with the dreadfully mundane final of 43-14—something that’s happened seven times before. (1)"
The Superbowl was named after an illuminati sacred bird, the "superb OWL", superbly hidden in the Seahawks emblem (2). Not enough to justify a "surprise". Only one thing can justify a surprise: the OWL's wisdom in "averting the chemical attack by syrian rebels that would cause the death of tens of thousands". the head of one OWL once the two SeaHAWK heads are inverted and joined. Not only did the Illuminati Supreme Leader mimic the two Seahawk heads but also it was the one in plain sight that had the Seahawks shirt on. Out of the two heads of the Supreme Leader, it's the one wearing the Broncos shirt that "coincidentally" belongs to the first officially gay man in History to be knighted. Denver's quarterback MANning crucified for being the first official football player gay ... for football, denying to become the first football player straightforward gay. The final score was on "their" shirts, with just the number 4 apparently missing. ... but the number 4 is on the ball. Last edited by TruthIsNeverTooHorrible; 02-03-2014 at 11:09 PM. I love your threads. I get my daily source of a laugh here! Thanks for the ridiculousness! You still must endure 13 days of "search for missing Malaysian Airlines" headlines. We are only 14 days from the act *** Obama arrrested on LIVE TV ***, exact replica of North Korea's Great Leader's uncle. Last edited by TruthIsNeverTooHorrible; 04-08-2014 at 10:29 PM. Deflated footballs is an illuminati joke about the end of the show. WHY [did / will] Seahawks win the very last Superbowl - all explained by Last Prophet in advance. Very Last Superbowl, 2014, by The Great Decider, Christ(of), the director of the Truman Show - ATTENTION this is NOT a joke. Last edited by TruthIsNeverTooHorrible; 02-01-2015 at 04:32 PM. Illuminati Grand Master chose the alternative script to the 33-33 result at Phoenix. Make no mistake: New England Patriots will be stripped of the title for cheating. Seahawks will be proclaimed the real winners. In other words: yet another BIG BANG parallel script. A few brave men in Slaviansk, Donetsk, among the last ones in Europe, forced the Illuminati Grand Master to stage an extra 2015 Superbowl. the impossible result announced in advance, It starts with a 4 in a ball, but not crystal clear, unlike the 3 and 8. How the Illuminati Grand Master engineered the impossible result 43-8 of Super Bowl 48, which will be proclaimed as the very last Superbowl. In other words: winners of head to head races 49 to 51 will all be stripped. Will The United States Be Destroyed Shortly?